My earliest memory of going to the movies is of a drive-in theater in Shawnee, Kansas, near Kansas City, Missouri where I was born. My mom would thoughtfully pack a red and black plaid picnic bag full of snacks, although once there, my brother and I would beg our dad to walk us down, over the humps of concrete and gravel to the drive-in cafe to buy burgers and fries. My dad skillfully built a custom platform that would sit in the floorboard, behind the front seats, and in front of the back seats, of their green, 1964 Pontiac. This well-crafted innovation was a “make-shift” playground for my brother and I to play in or to use when we got tired of the movies and wanted to lay quietly, looking out the windows at the stars and eventually fall asleep. I still laugh at a story my former husband always told of going to a rural drive-in theater, on a double date, with his high school sweetheart in Monroeville, Ohio. That drive-in backed up to a sheep farm and, during the film, a mischievous teenager cut the fence wire that separated the farm from the drive-in. Within minutes, while everyone was engrossed in the movie, or in romantic escapades, hundreds of sheep came up beside the cars bleeting “baaa….baaa” and carloads of movie goers were startled and laughing as the herd quickly spread through the rows of cars! Some people were so shocked they started their cars and drove off without first taking the speaker off the car window! My memories of old cinemas go back to my junior high school days. On weekends, one of my favorite things to do was meet up with friends at the old Ozark Theater in Ozark, Missouri. It was a run-down old place on the south side of the square that we all called the Rat-Trap. I remember buying big bags of popcorn for fifteen cents and being thrilled to sit next to the boy I had a crush on. Not only was I recently reminded that I received my first kiss there on the worn out velvet seats, but afterward I went home and threw up out of nervousness. My sweet friend, Debby, remembers worrying that she might get pregnant after kissing her first sweetheart there. Since then, I’ve always noticed old cinema buildings and drive-in theaters as I’ve driven throughout Texas, my home for the last twenty-seven years. The unique charm of their facades and the beautifully shaped marquees always capture my attention. 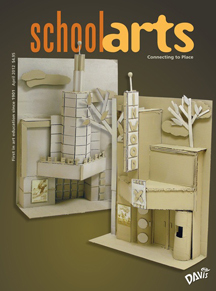 These memories sat in the back of my brain’s file cabinet for years before I was able to apply them to a successful high school project that was recently featured in the April 2012 issue of School Arts, a professional art education magazine. As the article explains, I was visiting a new friend’s home and quickly realized they were art collectors. One of my favorite sculptural relief pieces was by Dallas artist, Jon Flaming. Flaming’s love of Texas is evident in his landscapes and rural settings, and it was precisely when I saw his piece, “Nehi Bottling, Deep Ellum” that, in a moment’s flashing, I knew I’d found the project to apply my collected memories of “vintage cinemas” to. I invite you to read the article, which explains the project in detail, and see if you can apply it to a project of your own. For my readers who are interested in old Texas theaters, I used the fabulous website called Texas Escapes. Be careful, though; you can get lost in it for hours! Maybe you, too, have an interest in old cinemas, but perhaps you have a fond memory of old gas stations, old courthouses, old bridges or water towers. Stand in the quiet, perhaps after a yoga practice and think back to fond memories that you can build a project around. Make a list. What are you interested in? Pack a picnic, go to a park and lay down in the fresh, green spring grass. Look up towards the heavens and let your mind drift. Think back to childhood things. Remember what you loved. Is there a way to bring it to life through your teaching? I think the reason my students get so excited about their projects is because I’m excited about them, as so many of them have to do with me! As my colleagues always say, “As artist-teachers, we give our best ideas away to our students.” Through these projects I tell stories about me; things I experienced when I was their age, and they listen and laugh at how times have certainly changed. What are your favorite memories from childhood? Let’s create a project around them! I signed up for your blog after reading several of your stories and your artist’s statement. I look forward to more of your humor both in words and art. Your mobile home series struck me because that’s exactly the type of landscaping (geometric topiary) that the home owners would have in a (their) perfect world. 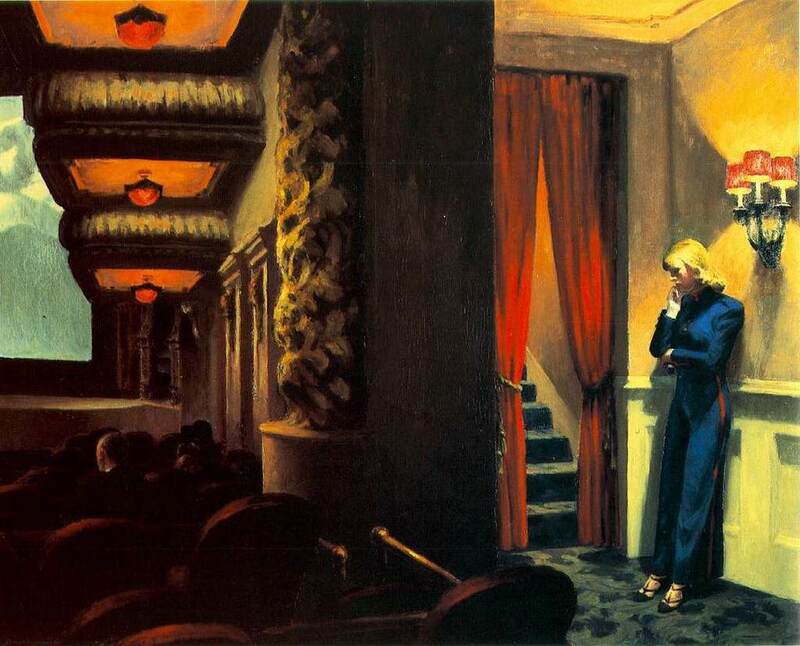 Very nice choice of the Hopper painting for the theater piece and even a Flannery O’Conner quote! We are happy to know there are inspired teachers such as yourself – and that their efforts are noticed by entities like School Arts Magazine. I’m sure it will be one of many. You certainly have it right – to be inspiring to your students, you need to have enthusiasm and inspiration yourself. Thanks, too for the intro to Jon Flaming’s fine work. I have ordered the book The Champion Pig which contains a photograph of a girl c.1948 – posing with her freshly-won bicycle. I will email you a photo of it when it arrives. I believe it was even taken in Kansas. Thank you for your kind words. I have enjoyed our email conversation and will look forward to sharing our interests in the future. Keep up the good work on http://www.texasescapes.com/! no memories from me, instead a comment on the importance of cinemas. We are in the process of buying a flat in Friedrichshagen Berlin, near the Müggelsee. The final thing that convinced me to move into that area was the cinema only a few hundred yards away from the flat. Downstairs it has a dance hall with round tables, therefor the movie is best watched from the balcony. I love it. Red velvet and thick carpets and it plays all the wonderful Eruopean films and some American too. It will be so lovely to walk to the cinema, no cars, no bus, no underground. I haven’t thought about the Ozark theatre in a long time. My mom worked nights which left my dad in charge. I remember my dad driving me in his red jeep and dropping me off on Friday nights. Giving me 50 cents for admission and a bit more for popcorn. I don’t think I ever watched the movie and remember one time having to call my dad to pick me up early. The movie was Valley of the Dolls and I was underage! It was the first time I became aware that movies had age restrictions — even back then! Obviously, my dad wasn’t paying attention either! Colleen! Thanks so much for reading! I don’t really think I ever watched a single movie either! No, Coy wasn’t paying attention, but he’s probably better off not knowing, right? 🙂 Love you! …a walk down memory lane….what a wonderful piece and to connect it with art, you are so creative and I love your writing style……off to create my childhood memory project! Let me know what you create! 🙂 What are some of your special memories? Thanks for reading! I had to laugh at the sheep story. Very funny. Dear Eagle-Eye, I’m so glad you laughed! I can just see those sheep in my mind’s eye! Hilarious. Thanks for reading, liking, and commenting. Hey, Jon! Thanks for reading. I’m not sure we ever covered the ground you mentioned. As a kid, did you ever go on field trips to the Agricultural Hall of Fame? I loved that place! It makes me sad, I cannot remember, so far, but still trying! Wouldn’t that be fun?! Do you remember the red and black plaid picnic bag? It had a matching thermos! So fun to remember my childhood memories with you!